"This is the place of eternal rest of Martyrs (Shahids) Ghassan and Uday Abu Jamal of Jabel Mukaber [neighborhood] in occupied Jerusalem, who ascended [to heaven] a month and a half ago during an operation (i.e., terror attack) at an occupation synagogue in occupied Jerusalem. 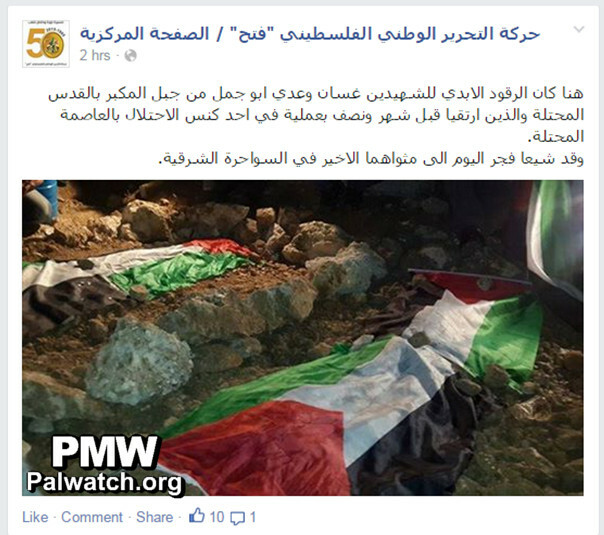 Early morning today, they were escorted to their graves at Al-Sawahreh Al- Sharqiyeh." Fatah called the terror attack "an operation at an occupation synagogue in occupied Jerusalem." On Nov. 18, 2014, the two Arab terrorists from East Jerusalem entered a synagogue in Jerusalem and attacked worshippers with guns, knives and axes, killing 4 worshippers and a police officer. 7 people were injured, 3 of them seriously. The terrorists were killed in an exchange of fire with Israeli police that arrived on the scene. "Yesterday [Dec. 25, 2014], the citizens of Jerusalem escorted the bodies of Martyrs (Shahids) Ghassan and Uday Abu Jamal, from the Jabel Mukaber neighborhood of south-east Jerusalem, to the place of their final rest in the Al-Sawahreh Al-Sharqiyeh cemetery, after they were held by the occupation for 37 days, and transferred to their relatives after midnight." Palestinian Media Watch also showed that Abbas' condemnation of the synagogue massacre was later explained away by Fatah officials as a condemnation for diplomatic reasons only. When Abbas later condemned the hostage taking in Australia by an ISIS affiliate and the subsequent killing of two of the hostages, PMW compared the two condemnations, showing Abbas' condemnation of the synagogue killings to be insincere.